The U.S. Office of Special Counsel (OSC), together with other agencies, enforces the Uniformed Services Employment and Reemployment Rights Act. This video from OSC explains the law and the process for filing a complaint. Employers cannot discriminate, but they are not required to give preferential treatment to service members. 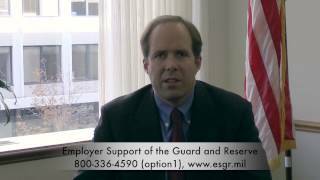 When an employee who works for the federal government is due to miss work, the employer may contact his/her military commander to explain the difficulties caused by the employee’s military service. ​ The employer may request changes to make the employee’s service less burdensome. However, the military is not required to agree to these changes. If a returning service member does not request reemployment in a timely manner, the employee may be disciplined. This discipline must be consistent with the way the employer normally disciplines other workers who are absent without leave or authorization for a similar period of time. The service member exceeded the five-year limit as defined in §4312(c). Important Note: There are many exceptions​ to the general five-year rule, where certain types of service will not count toward the five-year total. The exceptions are listed in subsections 1 through 4 of §4312(c). The Veterans Benefits Improvement Act of 2004, Public Law 108-454 (Dec. 10, 2004) requires employers to provide notice of the rights, benefits, and obligations of employees and employers under USERRA. To assist employers in complying with this requirement, the U.S. Department of Labor developed a USERRA informational poster to be posted at workplaces, available here.